Introduction: What Does Chinese Medicine Have to Do With the Four Humors? When one thinks of Greek Medicine, one immediately thinks of the Four Humors – Blood, or the Sanguine Humor; Phlegm, or the Phlegmatic Humor; Yellow Bile, or the Choleric Humor; and Black Bile, or the Melancholic Humor. These Four Humors and their associated Four Basic Qualities of Hot, Cold, Dry and Wet form the basic diagnostic and therapeutic compass upon which everything else rests in Greek Medicine; these are the four basic clinical entities from which everything else flows, and through which all other pathophysiological concepts are organized. Chinese Medicine, which is also called Oriental Medicine or TCM, for Traditional Chinese Medicine, on the other hand, is based on the foundational concepts of Yin and Yang, as well as the Five Elements, which, especially from an apparent or superficial appraisal, have nothing to do with the Four Humors. Yet, anyone who is the least bit observant when it comes to the clinical realities of human physiology and pathology can figure out that the basic reality of vital fluids having a major impact on one’s state of health or disease is undeniable. And so, although it is not oriented towards the Four Humors in its basic or foundational concepts, the Four Humors do indeed figure prominently in Chinese Medicine in many of its subsidiary concepts and doctrines. In this article, I will take a deeper look at the humoral concepts and notions of Chinese Medicine, and draw parallels between Greek and Chinese Medicine concerning the Four Humors. In conducting this study, I will progress from the most basic or fundamental principles towards the more detailed and specific. Hopefully, by the time I have concluded, you will be able to realize and appreciate the fact that the Four Humors do indeed figure into the theory and practice of Chinese Medicine. I also present this article as a kind of guide for practitioners of Chinese Medicine in their attempts to understand Greek Medicine and bridge the two systems in their clinical practice. Perhaps the greatest and most basic parallel between Greek Medicine and Chinese Medicine lies in their fundamental acknowledgement of the principle of polarity, and complementary opposites. In Chinese Medicine, this is famously summed up in the doctrine of Yin and Yang, with Yin being cool, moist, dark, passive and nourishing, and Yang being hot or warm, bright, active and dynamic. Furthermore, the Chinese recognized the dynamic interplay of Yin and Yang, embodying these complementary opposite qualities, in the great cycles of Nature. And it also realized that the human body, being a creation of Nature, also needed to maintain a state of dynamic equilibrium, or homeostasis, between qualities that were opposite yet complementary in nature. Of the elements of Nature, says Chinese Medicine, Yang is most akin to Fire, whereas Yin is most akin to Water. In Chinese Medicine, Yang and Yin are the two primal forces of Nature, which drive all physiology and metabolism in our bodies. In Greek Medicine, Fire and Water are the two Cardinal elements, which drive all the forces of Nature, as well as the physiology and metabolic processes of the body. Greek Medicine is also based on the idea of polarity and homeostasis, which is given primary expression in the doctrine of the Four Basic Qualities: Hot, Cold, Dry and Wet. As you can see from the preceding paragraph, the Hot and Dry qualities would be recognized as being Yang in nature by the Chinese, whereas the Cold and Wet qualities would be recognized as being Yin by the Chinese. 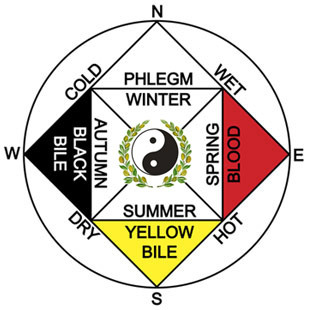 By assigning an active or dominant role to the Yang and Yin qualities of Hot and Cold, and a passive or secondary role to the Yang and Yin qualities of Dry and Wet, seeing them as the effects of the two active qualities, Greek Medicine is able to construct a medicine wheel that acknowledges the dynamic interplay of Yin and Yang in the great cycles of Nature and the seasons. Fire, having the qualities of Hot and Dry, is most active or dominant in the Summer, and is the most Yang element, whereas Water, having the qualities of Cold and Wet, is most active or dominant in the Winter, and is the most Yin element. The other two elements and their qualities represent transitional states between the extremes of Fire and Water. Another clinical concept of Chinese Medicine that is very much organized around the idea of complementary opposites is the doctrine of the Eight Principles. And of the Eight Principles, the two that relate most directly to the Four Basic Qualities are the principles of Hot and Cold, which, besides being manifested directly as heat or coldness, also refer to states of relatively high energy or vehemence versus indolent or passive states of relatively low energy. When blood, phlegm or body fluids are discussed in Chinese Medicine, the basic qualities attributed to them are also the same as those attributed to them in Greek Medicine, as we shall see. The first two essences, Qi and Blood, are almost always paired in Chinese Medicine, and in clinical practice, one is rarely seen without the other. Of these two essences, the one that most closely corresponds to a humor in Greek Medicine is, of course, Blood, which is basically identical to the Sanguine Humor. Similarly, the Chinese see Blood as being warming, moistening and nourishing, and also vital and exuberant, as well as regenerating. Qi corresponds most closely to Pneuma or the Vital Force in Greek Medicine. Chinese doctors say that the relationship of Qi and Blood is so close that they are almost like an object and its shadow. Greek Medicine expresses this incredibly close kinship between Blood and Pneuma by saying that Blood, or the Sanguine Humor, has a vital function as the humoral vehicle or medium for the transmission of Pneuma and the other vital principles. Chinese Medicine is quite elaborate and sophisticated when it comes to the differentiation of different types of Qi, but the form of Qi that is closest to the Blood, and which gives Blood the ability to nourish, is the Ying Qi. Yin, besides being one of the two great primal forces of Nature, is also, in relation to the Four Essences, a kind of catch-all term for the clear, watery fluids that cool, moisten, nourish and lubricate the organism; and so, the Yin of the body, in terms of the Four Essences, is commonly referred to as Body Fluids. Furthermore, these Body Fluids are further differentiated into two broad categories: Jin, which refers to the lighter, finer and more “misty” fluids of the body, versus Ye, which refers to the thicker, heavier fluids of the body, like the synovial fluid that lubricates the joints. From the above description, it is not hard to recognize the close parallel or equivalency between the Chinese concept of Yin, Body Fluids or Jin / Ye and the Phlegmatic Humor in Greek Medicine, which refers to the clear, watery fluids of the body that have the collective function of cooling, moistening, nourishing and lubricating the organs, cells and tissues of the body. Furthermore, Chinese Medicine recognizes that the Yin or Body Fluids derive their essential ability to moisten and nourish from the underlying Jing, or Vital Essence, which Greek Medicine calls the Radical Moisture. The remaining Essence of Chinese tonic herbal medicine is, like Qi, more energetic or functional in nature, and not, strictly speaking, a fluid, essence or substance. It is Yang, which corresponds most closely with what Greek Medicine calls the Metabolic Heat; Yang also encompasses the more active, dynamic and catabolic manifestations of certain endocrine glands and their hormonal activity, particularly the thyroid and adrenal glands. Whereas Qi pertains to the kinetic energy of the organism, Yang pertains to the thermal energy of the body, to the Metabolic Heat and the energy burning catabolic metabolism. So – of the Four Essences of Chinese tonic herbal medicine, two of them are actually essences, fluids or substances, and correspond quite closely with the two moist, flourishing humors of the body – the Sanguine and Phlegmatic humors. The other two pertain to energy and function. The fact that two of the Four Essences of Chinese tonic herbal medicine aren’t really essences at all, but energies, points to the more functional, kinetic and energetic emphasis of Chinese Medicine, which is rooted in the underlying Chinese worldview. As we have seen, the moist, flourishing humors – the Sanguine and Phlegmatic humors – are pretty much covered as Blood and Yin or Body Fluids in Chinese Medicine. But what about the other two humors – the dry, effete humors of Black and Yellow Bile? Of these two, it is mainly Yellow Bile or the Choleric Humor, which is called Dan in Chinese Medicine, that is on the clearest footing. Be it in Greek Medicine, Chinese Medicine or even modern medicine, Yellow Bile, or the Choleric Humor, is pretty much that same stuff that is created and secreted by the liver, stored and excreted by the gall bladder, and is involved in digestion, especially in its hotter, more Choleric aspects. The Chinese herbal patent medicine, Li Dan Pian, or “Pills to Regulate the Bile” is a common herbal formula that acts as a cholagogue to facilitate the flow of bile. In addition, some Chinese herbs are processed or prepared by frying them in ox bile, thus making them hotter, dryer and much more Yang in nature. As for Black Bile, or the Melancholic Humor, that is not on such a clear or sound footing in Chinese Medicine, or at least there are no simple or direct correspondences; rather, there is a constellation of clinical entities that have to do, in one way or another, with Black Bile, or the Melancholic Humor and its various activities and manifestations in the human organism. Even in Greek Medicine, it must be remembered that Black Bile, of all the Four Humors, is the most dry and effete, and exists in the organism in the smallest quantity or amount – so naturally, it is the hardest to isolate or put one’s finger on. And the same basic situation exists with modern medicine as well, where there is no single bodily fluid or clinical entity that corresponds directly with Black Bile, or the Melancholic Humor. Perhaps the most direct correspondences in Chinese Medicine with the humors of Yellow Bile and Black Bile, respectively, are the syndromes that are known as Yang Jaundice and Yin Jaundice, with the former presenting with a bright yellow complexion, and the later with a darker or dull yellow complexion. Yang Jaundice is associated with the liver and gall bladder, which is the storage receptacle for Yellow Bile in Greek Medicine, whereas Yin Jaundice is associated with the spleen, which is the storage receptacle for Black Bile in Greek Medicine. As Yang Jaundice is hotter and more vehement, whereas Yin Jaundice is more cold, chronic and indolent in nature, so is Yellow Bile hotter than Black Bile. The common cardinal symptom that pertains to both Yang and Yin forms of jaundice is a distension or fullness under the lower ribs, also known as hypochondriac pain, fullness or distension. Since morose, Melancholic individuals are often preoccupied with such feelings of fullness or discomfort under the lower ribs, we have the term “hypochondriac” for someone who is always feeling or imagining oneself to be ill. In older English language textbooks on Chinese Medicine, the condition of liver congestion and hypochondriac fullness and distension is even called Melancholia. In addition, there are a number of other interesting parallels that can be drawn between Greek and Chinese Medicine in relation to Black Bile. First of all, in terms of basic or fundamental correspondences, the spleen is the central organ when it comes to the Earth element in both systems, even though the constellation of syndromes surrounding the spleen has some differences between the two systems. In Greek Medicine, the spleen is the storage receptacle for Black Bile, or the humor of the Earth element, whereas in Chinese Medicine, it is the core noble or Zang organ associated with the Earth element and its function of digestion and assimilation of nutrients. In Chinese Medicine, the Earth element has a centripetal force that is always drawing things in towards the center via its gravitational pull, and the same could basically be said for the Earth element in Greek Medicine. In Greek Medicine, Black Bile has a Retentive virtue that dries, thickens, concentrates and crystallizes things, and in Chinese Medicine, the spleen holds things in. Also, in Chinese Medicine, the spleen loves dryness, and dryness is the primary basic quality of Black Bile in Greek Medicine. In Chinese Medicine, the spleen Qi thickens the Blood, and Black Bile, the spleen’s humor also thickens the blood in Greek Medicine. If the blood is too thin and weak, or if there is excessive bleeding, menstruating or hemorrhaging, you have to strengthen the spleen. Other parallels that can be drawn between Greek and Chinese Medicine involving the spleen, the Earth element and Black Bile have to do with the principle of polarity, or complementary opposites, in that Black Bile, or the Melancholic Humor, is diametrically opposite to Blood, or the Sanguine Humor, in its basic qualities; whereas Blood is warm and moist, Black Bile is cold and dry. From this perspective, a deficiency of Blood is identical in its basic qualities to an excess or aggravation of Black Bile, since a deficiency of warmth produces coldness, and a deficiency of nourishing moisture produces dryness. In Greek Medicine, Blood is the richest of the Four Humors, being produced from the choicest nutrients derived from food and drink, whereas Black Bile is the poorest, being derived from the coarsest and most meager share of nutrients from food and drink. In addition, Blood, as the humoral vehicle for Pneuma and the vital principles, is characterized by a lively exuberance of Qi or the Vital Force; Black Bile, as its polar opposite, is associated with conditions of deficiency and/or obstruction / stagnation of Pneuma and the Vital Force. The above polarities are not quite as clear in Chinese Medicine regarding Blood versus Black Bile, or the liver, which is seen as the storage receptacle for excess blood, versus the spleen, because the spleen is seen as playing a vital role in the production of Blood, since it governs the processes of digestion and assimilation. However, it is mainly in the deficiency syndromes of the spleen that the parallels between Chinese and Greek Medicine are most clearly seen, because these spleen deficiency syndromes are most often characterized by deficiency, especially of Qi and Blood, as well as dryness and a stagnation and obstruction of the proper flow of Qi, or the Vital Force, especially through the digestive system, which produces the gas, distension, colic and bloating that is associated with spleen Qi deficiency in Chinese Medicine, or Melancholic digestive disorders in Greek Medicine. The spleen syndromes associated with excess in Chinese Medicine, on the other hand, are mostly associated with an accumulation of excess phlegm and dampness, and are therefore of a more Phlegmatic character. A congestion or stagnation of Qi or vital energy in the liver in Chinese Medicine will produce, by reflex action, a deficiency of Qi or function in the spleen and stomach, and hence digestive disturbances of the Melancholic type. The cause of this syndrome in Chinese Medicine is usually attributed to excessive thinking or worrying, especially at meal times, which congests liver Qi and hurts the spleen. The liver on the right side and the spleen on the left side, with the stomach in the middle, provide a graphic portrayal of the necessity for balance in the digestive system on a psychosomatic level, and a liver / spleen imbalance or disharmony will impair the stomach and its digestive functioning. In both Greek and Chinese Medicine, the vital core of our digestive system, which produces and generates all humors or vital fluids, resides in this trinity of vital organs. The syndrome of nervous stress and worry impairing the digestive functions of the organism can also be called Neurovegetative Dystonia, in which the Sympathetic or Yang half of the autonomic nervous system is aggravated, to the detriment of the Parasympathetic branch and its digestive and vegetative functioning. Qi, Blood and Fluid Diseases: It’s All in the Flow! Just as important as keeping a quantitative balance and proportion of the various humors or vital fluids of the organism is maintaining a qualitative balance among them, which depends mostly on maintaining a healthy circulation and metabolism of the humors. This is a fundamental clinical truth or reality, whether it be in Chinese Medicine or Greek Medicine. And when it comes to maintaining a healthy metabolism, circulation and flow of the vital fluids of the organism, the main doctrine pertaining to this in Chinese Medicine is that of Qi, Blood and Fluid Diseases. So many of the chronic or intractable diseases suffered by so many are due in a very large measure to the poor circulation and metabolism of these three vital essences. And whether it be in Greek Medicine or Chinese Medicine, natural therapies exist to break up congestion and stagnation, and to reintroduce more exuberance, vitality and a healthy metabolism and circulation of vital fluids. The proper circulation and metabolism of Qi is important for a variety of reasons. Qi, or Pneuma, is the main motive force guiding all kinetic functioning of the organism. If the functioning of any organ or part of the body is deficient, so will be its Qi. If the free flow of Qi is blocked or impeded, there will be tightness, constriction or pain, usually at the very site of the constriction or blockage. Remove the stagnation, and you remove the pain. The pain that’s associated with a blockage of Qi is usually of a colicky, cramping nature. Maintaining a free flow of Qi is also important because Qi guides the movement and circulation of the Blood; if the Qi is not flowing properly, the Blood won’t flow properly either. Secondly, the free flow of Qi can easily be impeded via psychosomatic factors involving nervous or emotional stress and tension, and if this is held chronically enough, it will also impede the flow of Blood. The one organ that is most negatively impacted by an impeded flow of Qi and Blood is the liver, which is the storehouse of Blood in Chinese Medicine and the generator of the Four Humors in Greek Medicine. Without a proper flow of Qi and Blood, it is impossible to achieve or maintain an optimal functioning of the digestive organs, and without this, it is impossible to maintain an optimal generation and metabolism of humors and vital fluids in the body. Acupuncture is most directly involved with breaking up stagnation and blockages of Qi flow, but certain herbs can also regulate and facilitate the free flow of Qi. Blood, as we have seen, is a close partner with Qi in the health and functioning of the entire organism, and its healthy flow and distribution is dependent on a healthy flow of Qi more than any other factor. Where there is a stagnation of Qi, there will also be a stagnation of Blood, but where the pain associated with stagnant Qi is more colicky, cramping and ephemeral, the pain associated with stagnant Blood will be more fixed and cutting in nature. In addition to a stagnation of Qi, other factors or causes can stagnate the Blood, such as dehydration, which thickens it; extreme heat, which can also cause dryness or dehydration of the Blood; extreme cold, which can congeal the Blood; as well as bruising or trauma. Maintaining a healthy flow of Blood and avoiding undue clotting or congelation of Blood is especially important for women, who will usually experience menstrual pain and discomfort if it is present. The proper exuberance and circulation of the Blood is dependent on maintaining its Qi and vital principles; in Chinese herbal medicine, a number of different herbs exist that are used to vitalize the Blood, or to “make the Blood more lively”. A lot of devitalization and poor flow of the Blood, I feel is due to poor diet, and not consuming enough foods and herbs that vitalize the Blood. Body Fluids, like the Blood is also guided in its proper circulation and metabolism by the free flow of Qi. In addition, because Water, or fluids, is the polar opposite of Fire, maintaining a strong, healthy metabolic fire in the body is necessary for the optimal circulation and metabolism of fluids. Body fluids, as we have seen, comprise a large part of the overall rubric of the Phlegmatic Humor. In Chinese Medicine, there are three principal organs that are the main ones involved with the overall circulation and metabolism of fluids in the body. In the upper body, we have the lungs, which circulate and mist the lighter, finer fluids throughout the upper body; if this function of the lungs is impaired, there will be puffiness, swelling and edema in the face, arms, hands and upper body. In the middle body, and throughout the body in general, we have the spleen, which is responsible for the proper transportation and transformation of fluids, especially in connection with the digestion and assimilation of nutrients; if the fluid regulating function of the spleen is impaired, there will be a general puffiness and edema throughout the body, especially under the skin. The main organs governing fluid circulation and metabolism in the lower body are the kidneys, which also excrete excess fluids from the body; if the fluid regulating function of the kidneys is impaired, there will be swelling, puffiness and edema below the waist, in the hips, buttocks, thighs, ankles and feet. Too many in our modern world rely on harsh pharmaceutical diuretics to solve their fluid retention problems; wherever possible, the generally milder action of diuretic herbs is preferable, especially the gentler ones. The right diuretic herbs, in the hands of a skilled herbalist, can work wonders; in most cases, all you need to do is to improve the metabolism and circulation of fluids, then the body will automatically excrete the excess. The clinical entity of phlegm is one of the main focuses of Chinese Medicine, especially Chinese herbal medicine. There are a wide variety of expectorant herbs which, in one way or another, “transform phlegm”, which is basically the same idea as concocting phlegm in Greek Medicine. The point is that phlegm, being a manifestation of an excessive or aggravated Water element in the body, is best dealt with and removed by concocting it, which is like digesting or transforming it. This is the principle of Fire metabolizing Water. Chinese Medicine also acknowledges the many different distillations, permutations and changes that phlegm can undergo while in the human organism; in a nutshell, Chinese Medicine sees excess phlegm as having its origin in excess or stagnant fluids that are held in the body which, over time, can thicken into phlegm. In Chinese herbal medicine, there are two main kinds of phlegm: cold phlegm, which tends to be thinner and more fluid; and hot phlegm, which tends to be thicker and tougher. Cold phlegm is concocted or burned off with expectorant herbs that have a warming, drying character; hot phlegm is expelled with expectorant herbs that thin and liquefy tough, thick phlegm. There are many kinds of phlegm that are recognized clinically in Chinese Medicine. There is the insipid, watery phlegm that the body generates in response to extreme cold. There is phlegm-damp, which has its origin in the stomach, spleen and digestive tract due to a deficiency of spleen Qi, which is thick, clear to white, and slimy. There is hot phlegm, which can accumulate in the lungs and respiratory tract in response to colds and respiratory infections of a hot, feverish nature; it is usually thick, sticky and yellow to green in color. There are varieties of sputum that are frothy or bubbly, and there are also subtle kinds of wind-phlegm that obstruct the heart and sensory orifices, causing lethargy, mania, collapse or convulsions, as well as delusion and hallucinations, not to mention stroke and syncope, and there are also special herbs and medicinal substances used to treat them. I also believe that Vitelline Bile (see the Pathologies of Yellow Bile page in the Pathology section of my website), which is a particularly nasty amalgamation of phlegm and Yellow Bile that resembles an egg yolk, is connected with a Chinese medical syndrome called Damp Heat in the Liver and Gall Bladder. In short, there’s no shortage of phlegm syndromes in Chinese Medicine. When it comes to Xue, which Blood or the Sanguine Humor is called in Chinese Medicine, the parallels with Greek Medicine are quite obvious and striking. The basic qualities of Blood are heat or warmth, because it has the ability and the inherent energy to power cellular metabolism, as well as moisture, which gives Blood the power to nourish. The inherent heat or warmth of Blood predisposes it to syndromes and imbalances of heat, and the warmth as well as the nourishing moisture of Blood, as well as its rich and nourishing qualities, makes it a prime target for putrefaction, which in modern medical terms would be sepsis or infection. Once heat or putrefaction get a foothold in the Blood, they can be very tenacious and hard to eradicate. Furthermore, chronic lingering heat in the Blood can unduly dry it and injure its inherent ability to moisten and nourish. Chinese Medicine holds that heat attacks the body in four successive stages or levels: Wei, which is the outer defensive immune shield of the organism; Qi, which is the next level deeper, consisting of the body’s Vital Force; Ying, which is the nutritive energy of the organism, and that which gives Blood the power to nourish; and Xue, which is the Blood itself. Of these four stages, two of them, the most internal and advanced ones, deal with the Blood and its nutritive Qi or energy. In Greek Medicine, when excessive heat or inflammation enters the Blood, it is said that the Blood “boils over”, leading, among other things, to excessive bleeding and bleeding disorders. Chinese Medicine calls the bleeding syndromes caused by excessive heat in the Blood “reckless, marauding Blood”, but the essential clinical condition or reality is the same, regardless of the words you use to describe it. Other manifestations of excessive heat in the Blood include various kinds of skin rashes characterized by heat and redness. There is also the clinical entity of Chuang Yung, or Abscess Toxins in the Blood. Greek Medicine tells us that Abscess Toxins, or pus, is a toxic byproduct of putrefaction of the Blood, and that the body uses its metabolic heat to concoct, ripen, concentrate and peripheralize pus, usually into boils, blemishes or pustules appearing on the surface of the body. These are just a few of the ways that Chinese Medicine understands and deals with pathologies of Blood. Does Chinese Medicine have anything to do with the Four Humors? If you have followed me in reading and studying this article, the answer is an emphatic Yes. East or West, physicians and natural healers are dealing with the same body, and the same humors, or vital fluids. Clinical Truth is One, but the medical sages of East and West merely call it by different names. DISCLAIMER: The information in this article is for educational purposes only, and is not meant to diagnose or treat any illness or medical condition. The reader assumes all personal responsibility and liability for the application of the information contained in this article, and is advised to consult with a physician or licensed healthcare practitioner if their condition or symptoms persist or worsen.